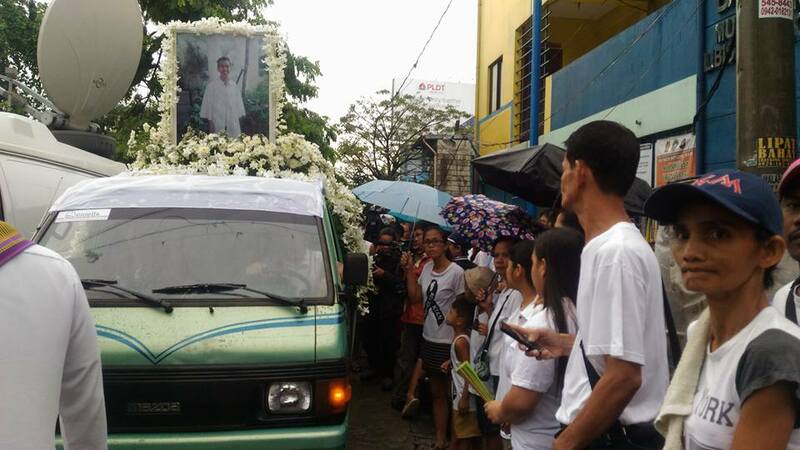 MANILA – Thousands joined the funeral march for slain teenager Kian delos Santos in Caloocan city earlier today, Aug. 26. The overcast sky highlighted the grief for a vibrant life abruptly snuffed, but the gray clouds may just as well signal worsening weather for President Duterte, whose War on Drugs has killed thousands, including children. “We march today to bring Kian to his final resting place and to support the call for justice for all victims of Duterte’s fascist drug war. We call for accountability of the police officers directly involved in the killings as well as accountability of the commander-in-chief who sanctioned the killings,” said Renato Reyes Jr, secretary general of Bagong Alyansang Makabayan (Bayan). Delos Santos, a 17-year-old senior high school student, was shot dead late evening of Aug. 16 by Caloocan City police men who accosted him during anti-drug operations and claimed he pulled out a gun and fired at them. Police later branded the slain minor as a “drug runner,” his father Saldy and other relatives, as “drug addicts.” Evidence and witnesses, however, strongly showed that police summarily executed a defenseless minor. Progressive groups, whose ranks have been continually red-tagged and attacked by state security forces, said the killing of Delos Santos exposed how Duterte’s War on Drugs only pandered to the fascist character of the police and military, and thus, as they expected, failed. 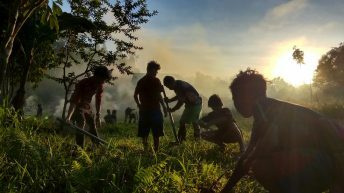 “The brutality of the drug war reflects the same fascist mentality and policies that have resulted in the militarization of the countryside and gross human rights violations against farmers, Lumad and Moro people. It is the same fascist mindset that has resulted in abuses under Martial Law and the US-led war on terror,” Reyes said. He also denounced the “shameless lying and fabrication of evidence” by the police against Delos Santos and his family, as reminiscent of how state forces vilify slain activists and file trumped-up criminal charges against those arrested. As public outrage mounted over Delos Santos’s killing, the Philippine National Police (PNP) virtually found itself in a quicksand, scrambling for excuses, such as finding “evidence” of the boy’s drug links in social media, and from a certain “Nono,” a “self-confessed drug pusher” in police custody. 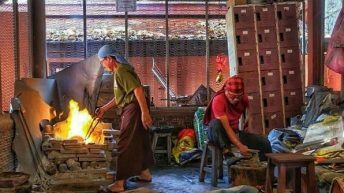 A number of social media accounts that claim Delos Santos was a “drug addict” were, however, exposed as fake, and may even be paid trolls. Many also suspect “Nono” to have been coerced into making his allegations. In reaction to the incident, Duterte said that the police men involved should be punished if they were found to have violated the law — an apparent toning down of his repeated assurance to police men that he will pardon them if they are convicted for crimes committed while performing their duty. He has also scoffed at human rights groups who criticize the rising, daily deaths in police operations and in vigilante attacks in urban poor communities. “The killings themselves corrupt the police force through a system of quotas and financial rewards for police officers. Rather than eliminating crime, Duterte’s grotesque drug war has spawned new crimes and encouraged impunity on an entirely new level,” Reyes said. 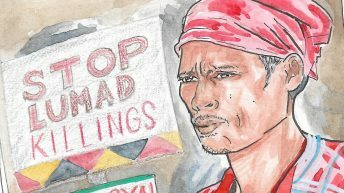 Indigenous and Moro people have even stronger words against Duterte, under whose regime the killings of national minorities continued, under the public’s nose. 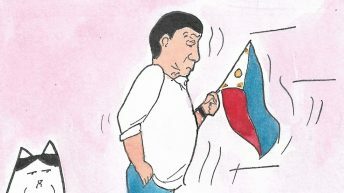 “Whether one is tagged “durugista” or “terorista”, no one is safe under the reign of Duterte, the Impunity King,” said Jerome Succor Aba, co-chair of the national minority alliance Sandugo. 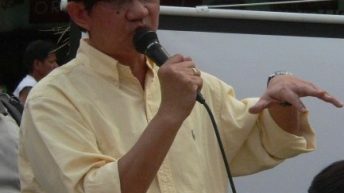 Tinay Palabay, secretary general of human rights group Karapatan, called Duterte’s anti-drug campaign a “disaster.” She said the police have long been involved in “extortion, corruption and other illegal activities,” citing the case of Korean businessman Jee Ick Joo who was kidnapped for ransom and killed by police men inside the PNP headquarters in Camp Crame. “The PNP itself is an organized crime syndicate,” Palabay said. 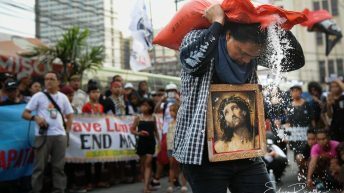 “The most that these murderers got were suspensions or reassignment, incomparable to the grief, injustice and rights violations they have inflicted to the poor,” she said. 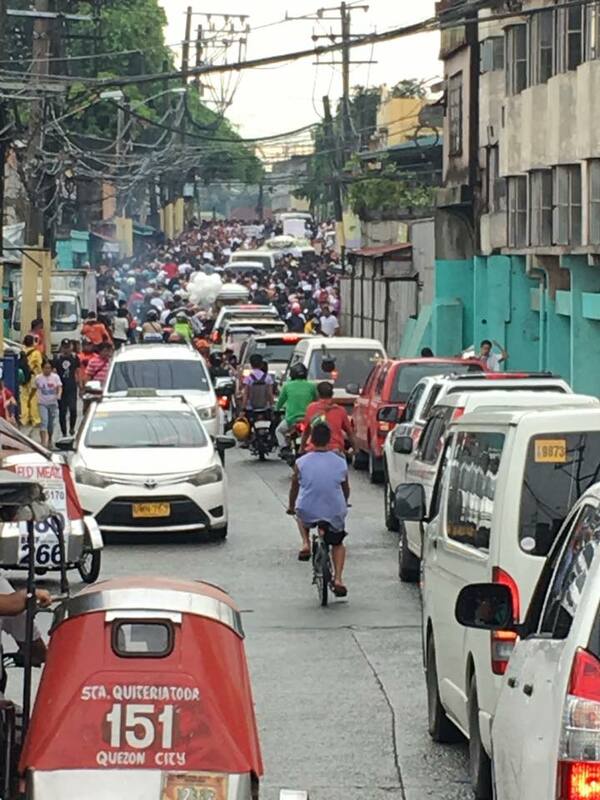 Bayan and other progressive groups took part in the funeral march, which saw thousands of mourners cramped in alleys and navigating narrow roads, converging at the Bonifacio Monument, eventually reaching La Loma Cemetery in Caloocan City where Delos Santos was buried in the early afternoon. The boy’s death also stirred his community in Barangay 160, Sta. 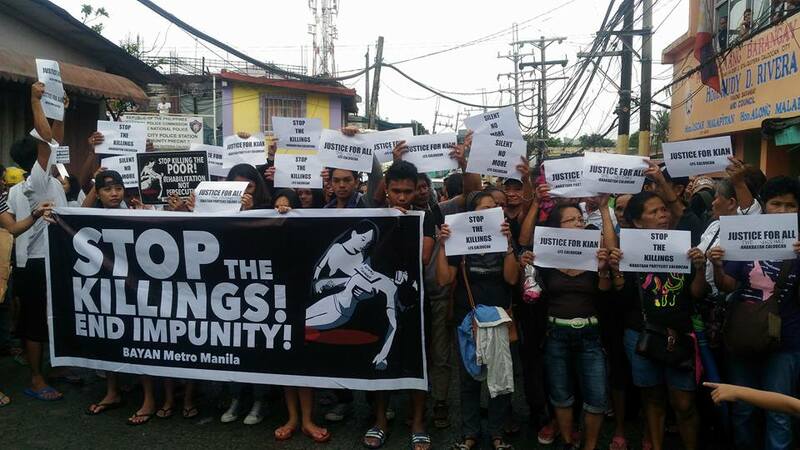 Quiteria, with many residents joining the call for “Justice for Kian,” and an end to the War on Drugs. 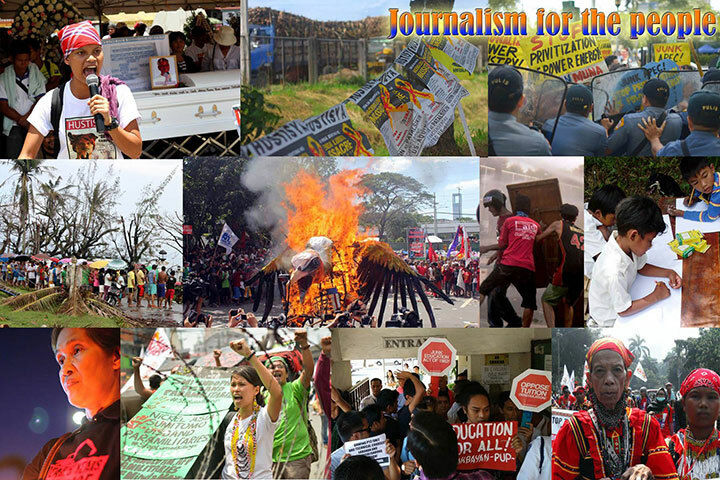 “The fight against impunity is a shared struggle of all freedom-loving Filipinos. The murder of Kian is an assault on all of us, especially the poor,” said Reyes.